A quick post about backcountry navigation. Most of us now have GPS, maps, and electronic compasses accessible in our phones. With solar charging options we can even overcome the battery issue for backcountry electronics. So what purpose does the traditional map and compass serve in our electronic world? This video – while referring to vehicle navigation systems – has some relevant points. Here is my list of things that make it important to be able to work with maps and compass. Malfunctions: The most obvious is that electronics can break or have software malfunctions or have display problems or any number of other technical issues. Reception: A lot of things can affect the reliability and precision of GPS reception; trees, cloud cover, precipitation, terrain, etc. Opportunity for human error: All it takes is entering one wrong digit in a long string of digits for you to go off in entirely the wrong direction. Scale: This is really important. As James May says in the video, you can’t really see your place in the big picture. You can zoom electronic maps in and out, but if you zoom out you are limited by the display size, so you can’t read detail. Having a quick reference picture of what is around you without having to zoom and pan makes keeping yourself located and keeping your sense of direction tuned in. Besides, looking at the map is a good excuse to take a rest. Sounds like my kind of skier. My friends and I took up backcountry skiing at the same time. A few years ago, as broke students we all simultaneously realized that we couldn’t afford resorts anymore. The burden of rent, tuition and the need to eat overpowered our desire to shell out a hundred plus dollars per day on a lift ticket. When we took up backcountry skiing we were terrified. Fresh out of avalanche safety training, we made our way to the slopes and realized that the strongest lesson we had learned, is that we knew nothing. Nothing. I have recently been rediscovering my inner Nordic skier, which has been slumbering for many years. 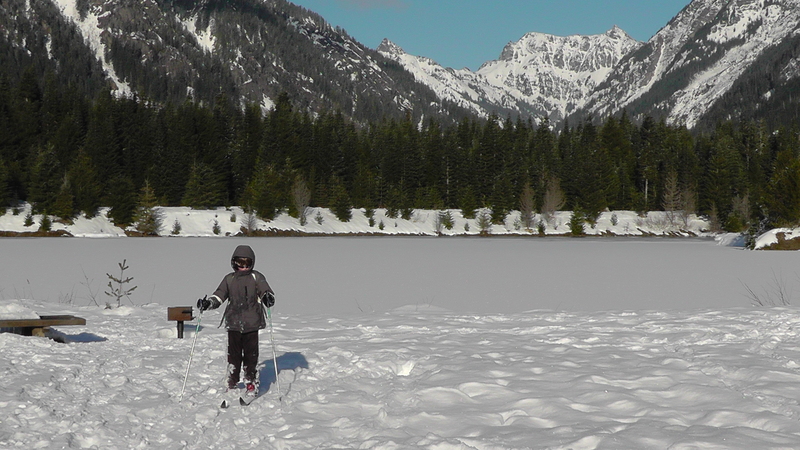 Ski tours this winter in Leavenworth, Blewett Pass, and Snoqualmie Pass – including one beautiful day introducing my 8 year-old son to what we used to call cross-country skiing – represent more classic touring than I have done in years. The simplicity of just moving across the countryside on light-weight gear allows me to focus on movement, rhythm, and accumulating mileage rather than vertical; enjoying the tour, rather than the turn. As a boy growing up in semi-rural western Massachusetts I grew up skiing both alpine and cross-country. I had the extraordinary benefit of having corn fields around my house, so I was able to ski out my back door whenever there was enough snow. As a teenager we moved to the hills and woods where I could explore even farther. Track skiing was a rarity at home, but on family trips to Colorado or northern New England we would ski at the nordic resorts. I was always trying to ski faster, sometimes imagining a cross country race the way other kids imagine a football game. When I was in college, my dad and I took a trip to a hut on the 10th Mountain Trail in the Colorado high country. The gear was typical for the time – which is to say terrible – but we shared space with a guided group and played around on slopes near the hut. From that point I rarely skied cross-country and my focus turned to telemarking and peak touring. I soon moved to the Northwest where I skied some of the standards: Mount Saint Helens and Mount Adams as well as some moderate tours in the Central and North Cascades. I enjoy a challenging adventure and the aesthetics of leaving fresh tracks – and not just a few sitzmarks – in the backcountry but I have never been a real adrenaline junkie. With a busy family life I often just want to explore new areas, visit places for their beauty or solitude; where turns are more of a bonus or a pleasant side-effect rather than the goal. On my tours I sometimes feel the payoff of moving lighter, faster, and farther is greater than the modest descent. My patrol always provides course support for races at a local public-access nordic ski area. We ski out on the course with our patrol packs, hang out at one location for a while and watch the racers go by. On the longer races we rotate positions periodically during the race to stay warm. For someone like myself – who as a kid, inspired by images of Bill Koch, would roll up his stretch ski pants like knickers and treat every outing like a time trial – slogging along while the racers flew by became torture. This season I decided to return to my my roots (a few technological advances not withstanding). I got my first ever NNN set-up and have spent the season embracing my inner kick-and-glider. Even while carrying a patrol pack, the relative weightlessness, speed, and sound – specifically the lack of it – feel familiar and comfortable. It has been like a little recreational homecoming.